For years now, it’s been impossible to find a ticket to the annual Fauquier County People’s Choice Wine Awards. They sell out every year, and it’s easy to see why: no queuing in crushing lines, beautiful (indoor) venue at Airlie, tasty wines, and ever-flowing hot and cold hors d’oeuvres. Plus, you get to vote. Each guest gets three color-coded voting cards – Favorite Red, Favorite White, and Favorite Sweet. At first, the voting concept seems easy enough: when you taste a favorite, you drop your card into a little box on the corresponding table. 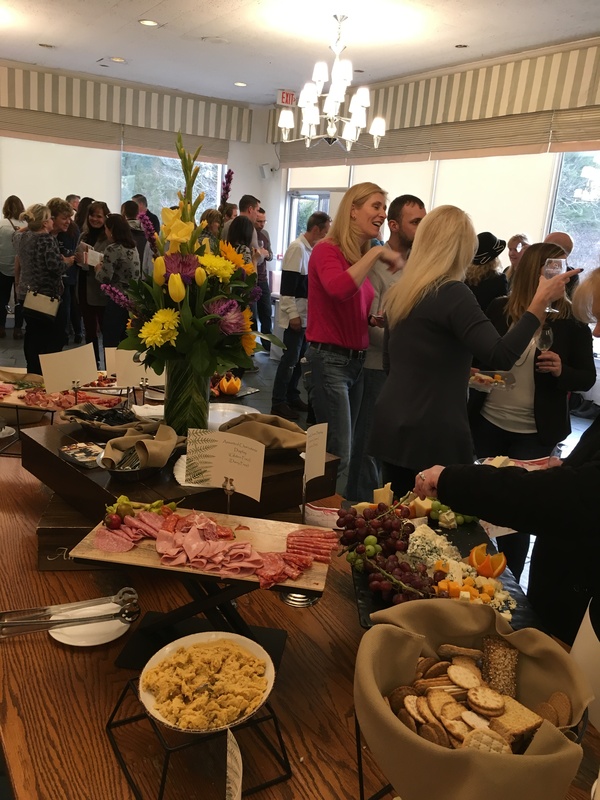 This year, fifteen wineries poured tasting samples on two floors of Airlie House, with live music and plentiful platters of cured meats, fancy cheeses, and creative empanadas and such on each level. Forty-one wines were poured “officially,” though a few enthusiastic wineries raised the count with even more unofficial bottles. As the clock ticks down, the voting cards start to burn a hole in your pocket: time to choose. But how? So many factors enter in: the wine itself, the friendliness of the people pouring the wine (yes, this should not be part of the decision-making process, but let’s admit: it is), your memories of a relaxing day you may have spent at that vineyard. It’s tough, and you may find yourself avoiding eye contact with one table as you drop your card at the next. But quickly, it’s all over but the counting. While we wait, we talk to Fauquier’s tourism officials to pass the time. “This event happens at a time of year where it is usually pretty quiet for most tourism businesses including the wineries, so this is a really great chance to get out and shake off your cabin fever and try some of the best wines in the region,” says Tourism Coordinator, Laura Torpy. And then, a bell assembles those of us who haven’t gone on to dinner (though how is that even possible with all those nibbles?) and the announcements begin. 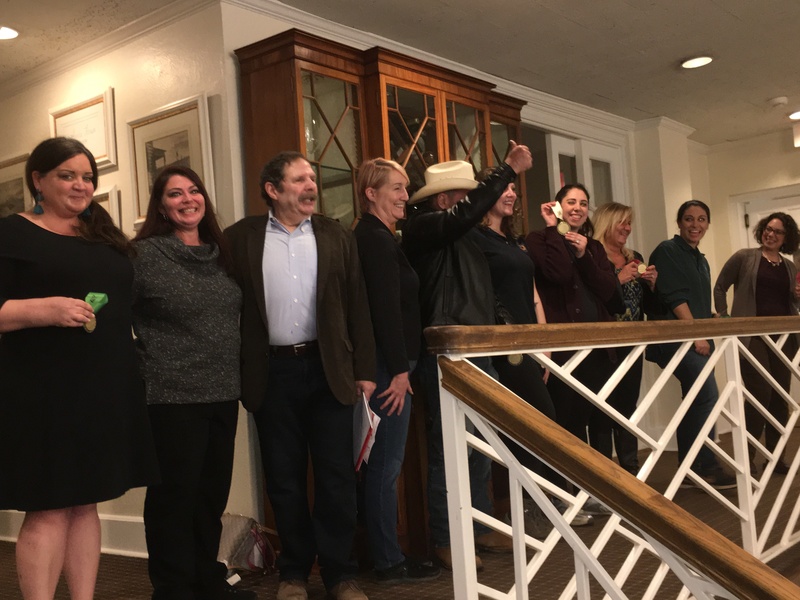 This year is a sweep for the Papadopoulos family of Mediterranean Cellars in Warrenton, which walks away with an award for Top Red, Top White and Top Sweet. The family’s other winery, Molon Lave, also nabs a Top White award, to much cheering and clapping of the crowd and hugging between the two Papadopoulos sisters in the room, Katherine and Leah. Here is the complete list of winners for 2019. Note that no individual scores are announced; the top three vote-getters in each category win equally. « Nina Tisara – Still a Force to Reckon With!